MANCHESTER, England — When the ball came bouncing off the English crossbar, Canada captain Christine Sinclair brought it down with her thigh and nudged a shot over the line. "I like to think I can be calm in that situation," Sinclair told The Associated Press. "I've been there a few times in my career." More than just a few times. Far more. Make that 180 goals now for Canada for Sinclair. For the 35-year-old forward, the most important thing was securing a 1-0 victory over England on Friday in the buildup to the Women's World Cup. But she can't get away from the fact that four more goals will match the record international tally of 184 held by Abby Wambach, the retired American. "It's a huge honor just to be on this journey and chasing down Abby," Sinclair said. "I'm just trying to not have the goal thing being a focus going into the World Cup." Canada's dreams of World Cup glory on home turf were ended by England in the quarterfinals in 2015. The fifth-ranked team opens its campaign in France on June 10 against Cameroon in Montpellier in Group E.
"Sooner or later, hopefully, it'll come," Sinclair said of the goal record. "Whether it happens before during or after (the World Cup). Just as long we continue to perform." 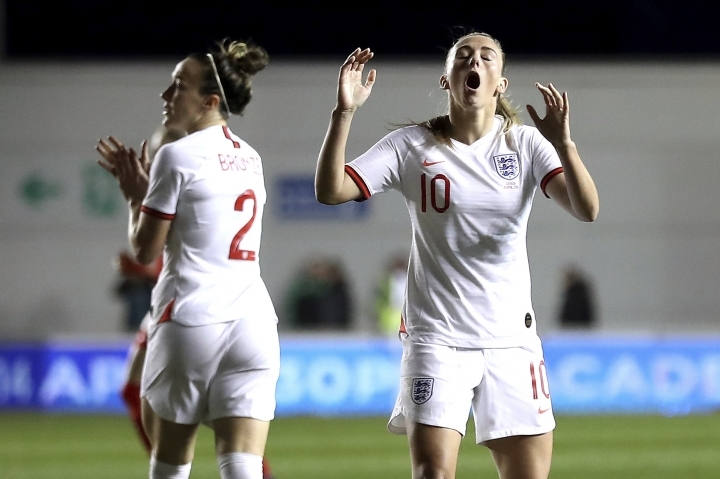 Sinclair's goal broke the deadlock in the 81st minute at the Manchester City Academy Stadium, pouncing after goalkeeper Karen Bardsley tipped Nichelle Prince's volley onto the crossbar. "She's a huge thing for this side," Canada coach Kenneth Heiner-Moller said of Sinclair. "Part of the reason England haven't got the calmness on the ball is because she is doing so much hard work and she can score as well." Not only did the Canadians beat England in front of 5,682 fans, it was their fifth successive game unbeaten and without conceding. "Defensively, we have been amazing this year," Sinclair said. "Anytime you can get a result against one of the top teams in the world in their home stadium, you're feeling very confident." It was only last month that England won the SheBelieves Cup, which took it up to third in the FIFA rankings. But Toni Duggan endured frustration in front of goal with several misses on her return to Manchester, where she played for City before joining Barcelona in 2017. "I didn't think we deserved to lose," England manager Phil Neville said. "I saw a team that tried to be brave. I thought our composure in the final third let us down, particularly in the second half." England opens its World Cup campaign against Scotland in Group D on June 9 in Nice, France. Daily Sports Global, your guide to the best sports news on the Internet. Access to the world’s biggest sports events right here even if you’re not physically there. Copyright © 2015 - 2019 Daily Sports Global. All Rights Reserved.